Anchor Brewing has been brewing their Christmas Ale (a.k.a. Our Special Ale) since 1975. And every year for the past 39 years, a unique beer has been brewed for it and a different tree is featured on the hand drawn label. However, I think the trees are more varied then the recipe as I find the beer tastes pretty similar each year. It's a beer that has basically become synonymous with the holiday season for me and I have a tradition of enjoying a magnum of it on Christmas Day. 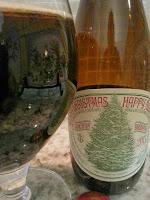 This is definitely one Christmas beer that contains a lot of holiday spices in the aroma and flavour. Ginger, nutmeg, cloves, cinnamon... pretty much just name a traditional holiday spice and it's in there. Some years have been more intense then others but this year it seems to be pretty balanced. Along with the spices is some molasses, brown sugar, roasted malts and a bit of a pine bitterness in the finish. The alcohol level will also vary, but it's typically around 5.5% ABV, making it an easy drinking Christmas ale.